Klaproth! Nobody observes that flat-floored crater south of Clavius because there is nothing to see there. That is what I thought too until I looked at this low sun image by Paolo and Cristina. Immediately I saw that that boring flat floor isn’t flat. There are two or more elongated ridges from the center toward the western half of the floor. 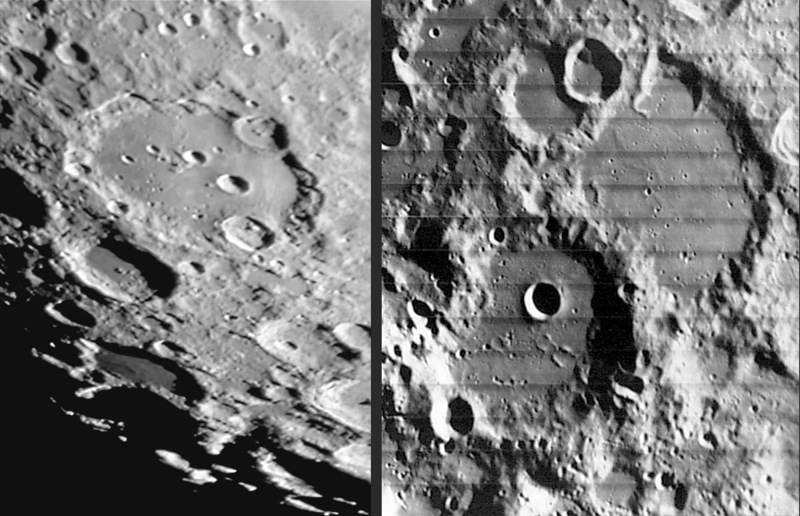 Checking other terrestrial images I didn’t see the ridges and finally on one of three Lunar Orbiter views (right image above) of the area the ridges are visible. Just as interpreted from P&C’s image the ridges are relatively short but extend halfway across Klaproth’s floor. They look like mare ridges, and the small dome-like circular blip to the right and the upper craters whose walls are missing also suggest that a liquid material flowed across the floor. This evidence reminds me of the unhappiness I feel toward the official interpretation that the smooth material filling crater floors in the southern hemisphere of the Moon is fluidized ejecta from Orientale. This interpretation is made for only one reason. The floors of Klaproth and other smooth floored craters here are spectrally the same color as the rest of the highlands. And in full Moon lighting the floors are not dark, as mare material is. I have thought for years that the occasional mare ridge and embayed craters found on light-toned floors strongly suggest that a non-mare composition volcanism has occurred on the Moon. Perhaps some day we will find conclusive evidence for volcanism on these floors. April 8, 2006, 21h 04m UT. Newton 261 LFB F/4.8 + Barlow 2x Abbe Baader-Zeiss + Phillips Toucam Pro B/W + R-IR filter. This page was last modified on 1 August 2016, at 01:05.